For those of us, whom the well organized Right on the internet describes as “sickular”, the prospect of Modi as Prime Minister is unthinkable. Congress is then a reflexive default – not a party of choice. Its secular credentials too are tarnished with 1984, but its communal capitulations are opportunistic (and thus contained) unlike the BJP with its official Hindutva party plank. Moreover with all its corruption and contradictions, the Congress has always had a strong left-liberal strand, providing some space for engagement to further progressive agenda, enacting for instance the landmark Right to Information Act, NREGA and FRA. 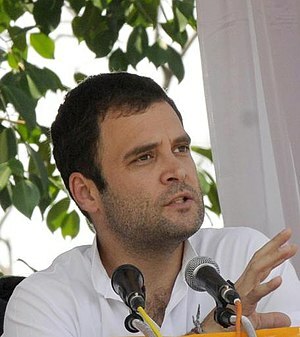 However faced with a Rahul Gandhi versus Modi contest – the former a reluctant prince leading a dithering party, the latter the decisive machismo king of no-nonsense governance – it appears that Congress has decided to move so far to the Right that 2014 looks set to become a Modi versus ‘sickular’ Modi contest. Make no mistake — this is not my assessment. I’ve just borrowed it from our Chief Minister, the redoubtable V.S. Achuthananadan, the foremost of (official) revolutionaries in Kerala, whose memories of struggle stretch back right up to the workers’ uprising of the 1940s in south Kerala, the Punnapra-Vayalar, celebrated in communist myth and legend. In September this year it appeared as if the CPM was ready to negotiate with the protestors, but nothing has really moved. The latter have hung firm in their resolve, it requires a rather strange imagination to read that as evidence for ‘peace and prosperity’ at Chengara. The Congress has now emerged, after much slumber, with support for the struggle, and V.M. Sudheeran, one of the most popular and respected leaders of the Congress, has sharply condemned the CM’s statement (below).